The Basques, from the Pyrennes region between modern France and Spain, had been hunting whales in their own waters since at least the 11th century. By the early 16th century they were venturing out across the Atlantic to visit the Gulf of St Lawrence and adjacent areas, at least 20 years before the “official” voyages of discovery financed by Francois I. Every year they set out in pursuit of their precious prey, at the time considered fish (called “Lenten bacon, fast fish, blubber fish” or “crapois”). Whale meat and fat were indeed highly prized and the blubber was used to make oil for lamps. In 1534, Jacques Cartier encountered many Basque whalers on his first expedition to North America, mainly in the Strait of Belle-Isle, which separates the island of Newfoundland from Quebec and Labrador. The following article recounts the history of whale hunting as practised by the Basques. After providing a detailed description of the evolution of this practice and the resources found in the Gulf of St. Lawrence, it presents the sites where the whalers settled, among others, at Red Bay in Labrador. The author explains the techniques and methods used by Basque whalers to catch and derive profit from these mammals. Lastly, it describes the everyday life of these courageous men who landed on the coasts as soon as the ice melted, and left when winter returned. The sixteenth-century Basque whale hunt in the Strait of Belle Isle is one of the most engaging chapters in early Canadian history. The subject blends elements that have broad popular appeal: whales, large intelligent mammals hunted close to extinction; a period that is forgotten or, at least, ill-remembered; and the Basques themselves, a people often considered mysterious, given their non-Indo-European language and a suggested cultural affiliation with the original post-glacial peoples of Europe. For this reason, the Basque whale hunt has often been romanticized. We need to be cautious about claiming that the Terra Nova hunt is long forgotten. In 1613, Champlain identified the Strait of Belle Isle as the location of the Basque whale hunt. Like many historical industries, it may well have slipped from popular memory, but, throughout the nineteenth and twentieth centuries, it was an enduring part of the historical record. As for the supposed mystery of the Basques, in a way, the Basques became mysterious only with the rise of modern Spain and France, which left them ethnic others straddling two nation states. Even if they are, in this sense, mysterious, we cannot assume that they must have discovered the Americas long before Columbus. There is, in fact, no contemporary evidence for a pre-Columbus or pre-Cabot European presence, although claims were made in the seventeenth and eighteenth centuries of Basque precedence in the New World. Experts in the documents of the period, however, insist that there is no convincing evidence that the Basques exploited the waters of Atlantic Canada before the early decades of the sixteenth century. One could also point to other early modern claims that Azorean sailors, Bristol fishermen or Breton navigators beat Columbus and Cabot to the New World. Finally, given the visibility of whaling stations, both literally and culturally, Basque whalers have earned a place in the popular imagination as the primary European presence in Atlantic Canada in the early sixteenth century, even though the early modern migratory cod fishery preceded it and was significantly larger. On the other hand, the Basques were, from the outset, among the most effective, and certainly among the most persistent, cod fishers along the coasts of what is now Canada. They were pre-eminent early whalers and the only European whalers operating in our waters in the sixteenth century. The Basques also established close contact with Aboriginal Peoples early on. The Basque Country straddles France and Spain, but only the three smallest provinces fell under French administration: Labourd, Basse-Navarre and Soule. The coastal provinces — Vizcaya and Guipúzcoa (in Spain), and Labourd (in France) — were the most active in both fishing and whaling. The key port of Bayonne, on the frontier between Labourd and Gascony to the north, played an important role in both industries, at least in certain periods, as did the smaller port of Saint-Jean-de-Luz. The origins of the European whale hunt lie in the Mesolithic period, many millennia ago. By medieval times, whaling was important for Basque coastal towns, culturally as much as economically. This significance is suggested by the prominent place given whales and whaling in the town seals of the period. The sixteenth-century Basques recognized about eight species of whales. Their primary prey was the North Atlantic right whale, which they hunted in the Bay of Biscay. They called it sarda (schooling whale) because the whales could be found together in pods. The English name echoes whalers’ early preference for this species: it was the “right” whale to hunt because it was a slow swimmer and easily caught. In addition, unlike the humpback, minke and blue whale, the right whale floated when it was killed — a huge advantage in the centuries before the invention of winches and lines strong enough to haul the body of a dead whale from the depths. The Basques also hunted the grey whale, which they called otta sotta and which is now extinct in the Atlantic. By early medieval times, the people of Labourd had developed their own whale-hunting custom. They spotted their quarry from stone lookout towers along the coast, called atalayas. The hunters then launched boats and pursued the whales. This early hunt seems to have been a corporate municipal effort, rather then a commercial one, and obtaining meat was probably as much of a goal as obtaining oil or baleen. The annual catch was probably 100 whales at most. So the sixteenth-century whale hunt in Atlantic Canada was a new kind of venture, even for the Basques, for it was the first commercial whale hunt. Although the French Basques of Labourd had been involved in whaling since medieval times, they had little part in the sixteenth-century transatlantic hunt, which was dominated by ships from San Sebastián and Pasaia in Guipúzcoa, and Spanish Basque merchants from further inland. The Basques could not have developed a commercial whale hunt without markets. At the time, whale meat was still salted for consumption during Lent. (Conveniently enough, the whale was considered a fish for religious purposes.) Whale meat was not, however, exported in commercial quantities from Atlantic Canada to Europe. The main product shipped was oil, rendered from whale blubber. As a secondary product of the hunt, the Basques also collected the baleen from the mouths of the whales, which filter krill and other small marine creatures. Baleen consists of hard but flexible, and somewhat curved, plates (up to a metre or two in length) and could be used the way we might use fibreglass-reinforced plastic: for archer’s bows, buckles, helmets and so on. Whale oil was used primarily for lighting and lubrication, but sixteenth-century industries also used the oil in tanning, for finishing broadcloth and as an ingredient in soap. The Basque province of Navarre in Spain was an important producer of leather, so part of the market for whale oil was regional. Most of this product was shipped northwards, however, usually from San Sebastián, but sometimes from Bordeaux, or directly from Labrador to Nantes, Bristol, Amsterdam and so on. Although there is little documentation on early voyages to Atlantic Canada and the Gulf of St. Lawrence, historians have uncovered enough to be able to establish that the Basque transatlantic whale hunt emerged from the migratory cod fishery. Growth in the Basque cod fishery in la gran baya (the Grand Bay, the Gulf of St. Lawrence) is documented from the 1520s to the 1530s. In the 1530s, crews seem to have occasionally engaged in whaling as a kind of fall-back activity when the fishery was poor. Basque activities in Atlantic Canada expanded considerably after merchants began to mount separate specialized whaling and cod-fishing voyages in the late 1540s. Crews from the French Basque territory of Labourd were just beginning to participate in the migratory cod fishery in the 1540s and were not really involved in the Strait of Belle Isle whale hunt in the sixteenth century, although they did take up whaling further up the St. Lawrence, particularly in the seventeenth and eighteenth centuries. In the Strait of Belle Isle, the Basques hunted both the right whale (Eubalaena glacialis) and its close relative, the bowhead whale (Balaena mysticetus). They called the bowhead barba (bearded one) because it carries more baleen than the right whale. The bowhead is also larger. Zooarchaeological remains from the major whaling station at Red Bay, Labrador, indicate that bowheads and right whales each accounted for about half of the whales taken by the Basques there. The bowhead would be the major species exploited by the Basques and the Dutch at Spitzbergen in the seventeenth century. In 1622, when Thomas Edge described the northern whales frequenting Spitzbergen waters, he called the bowhead “the Grand Bay whale”, a name also used by the Basques: granbaiako balea. The bowhead is now an Arctic species, rarely reported in the western Atlantic, south of Hudson Bay. Right whales are rare as well, although they are reappearing today off the coast of Canada’s Atlantic provinces. Like the dry salt-cod fishery, the early modern whale hunt was shore-based. The Basques set up rendering stations along the coast from which they launched whaling boats (chalupas) to chase their quarry. A commercial hunt in the Strait of Belle Isle is documented from about 1545. The Terra Nova industry peaked in the 1560s and 70s, when as many as twenty ships and 2,000 men crossed the Atlantic to the Grand Bay every summer. Whaling in the Strait had declined sharply by 1600 and had ended by 1620. Several factors may have contributed to this: a fall in the price of whale oil, naval conflict between Spain and England from around 1585 to 1605, impressment (forced recruitment) of mariners into Spain’s great Armada of 1588, inflation, taxation by the Spanish Crown, climate change, or a combination of these factors and a decline in regional whale populations. Historians seem to resist the idea that the Terra Nova whale hunt had a serious impact on populations. This is perhaps a hasty conclusion. If about twenty ships a year were whaling at Labrador between 1560 and 1580 (based on the nineteen documented in 1572), and if each ship took fifteen to twenty whales, then the Basques were capturing about 300 to 400 whales a year, for twenty years. This suggests the elimination of 6,000 to 8,000 individuals. When the whales taken before 1560 and after 1580 are taken into account, as well as those that died of harpoon injuries without being captured and processed, there must have been a serious impact on the populations of slowly-reproducing right and bowhead whales, which grazed off Labrador before the arrival of the Basques. The zooarchaeological perspective suggests an alternative interpretation. According to recent estimates, there were about 11,000 bowhead whales and about 12,000 to 15,000 right whales in the western North Atlantic in pre-contact times (before 1540). The same study suggests a total catch of 25,000 to 40,000 whales between 1530 and 1610 — a considerably bleaker picture. There is even evidence of reduced populations as early as the 1570s. After the decline of the whaling industry in the Strait of Belle Isle, around 1600, the Basques continued to hunt whales in the Gulf of St. Lawrence, where they pursued other species as well, in particular the smaller beluga whale. The French Basques of Labourd set up an important whaling station on the St. Lawrence, at Île aux Basques, near Trois-Pistoles, Quebec, across from Tadoussac. Archaeological evidence suggests that the station was operational for half a century, between about 1585 and 1635. By the 1660s, it had been abandoned. From 1540 to 1640, the Basques also set up shore stations at many other locations on the north shore of the St. Lawrence: Chauffaud-aux-Basques, Les Escoumins, Sept-Îles and the Mingan Islands, near Anticosti Island, where a whaling station was in operation in the second half of the seventeenth century. There seems to have been a second wave of Basque whaling activity in the Gulf between about 1735 and 1755, at Bon-Désir, near the mouth of the Saguenay, in the Mingan Islands and at Sept-Îles. A site has recently been identified at Little Mecatina, near Harrington Harbour, Quebec. A multi-component site, it was also used in the shore-based fishery, and possibly by other ethnic groups as well. Many of the processing sites in the Gulf of St. Lawrence interpreted as whaling stations may in fact be later sealing stations. The Basques were also involved in sealing, in the Madeleine Islands in the 1660s, for example. Their exploitation of the islands’ resources dates back to the sixteenth century, when they and the Bretons hunted walruses there — so effectively that the species no longer exists in the Gulf of St. Lawrence. The Basques chose their whaling stations carefully. They preferred deepwater harbours protected by an island — key features of the important station on Saddle Island, in Red Bay, Labrador. That lonely outport was identified as the place the Basques called Buytres or Butus, by far their most important Labrador shore station in the second half of the sixteenth century. Every summer and fall, thirty to fifty whaling boats, associated with eight to ten ships, would operate from that large station. These figures imply a seasonal population of 500 to 1,000 Basques, plus an unknown number of Innu (Montagnais) attracted by opportunities for trade. Red Bay became, by far, the best-researched Basque whaling station in Canada. The archaeology of the site is the main basis for the material culture interpretation presented here, although there are also excellent documentary sources and archaeological findings from excavations at Chateau Bay, Labrador; and at Île aux Basques and the Mingan Islands, Quebec. At Red Bay, crews from Memorial University have excavated rendering ovens, a cooper’s shop, several small dwellings and even an extensive Basque cemetery. Just off Saddle Island and, strangely enough, close to the still-visible wreck of the Bernier, a modern coastal freighter, lies the wreck of a sixteenth-century cargo ship. It is more likely than not the wreck of the San Juan of Pasaia, Spain, reportedly blown aground in Red Bay with a cargo of oil in 1565. This cannot be confirmed because there are at least three other early wrecks of about the same size in Red Bay harbour, not to mention some important small-boat finds, including several whalers’ chalupas. However, the evidence assembled points to the San Juan. Documents retrieved from Spanish and French archives, together with the archaeological excavation of the site on Saddle Island, the wreck of the San Juan and a chalupa, make it possible to reconstruct much of the early Basque whaling industry. Each spring, the merchants of the Basque Country organized expeditions. They hired a captain to assemble a crew and provisioned a vessel, often in Bordeaux. Some ships engaged in the whale hunt and others in the salt-cod fishery. The Strait of Belle Isle was often blocked with sea ice into late spring, so there was not much point in setting sail for the Grand Bay until May or even June. It is not known how crews claimed shore stations in the migratory whale hunt. The first-come, first-served admiral system, prevalent in the cod fishery, may not have applied to the whale hunt. Whaling infrastructure was more expensive and more durable than that of the shore-based fishery, so it is possible that well-armed whaling crews would insist on their right to re-occupy the slipways and ovens they had constructed in previous years. The whaling season often extended well into the fall, much longer than the cod fishery, which normally wrapped up in late August. This extended season, dictated by the migration of the bowhead and right whales, which were found in the waters off southern Labrador from early summer through late fall, sometimes left whalers with no choice but to overwinter in Canada. When whale stocks declined later in the sixteenth century, crews were sometimes forced to overwinter because they stayed too long on the coast and found themselves trapped by ice while trying to produce a decent cargo of oil. In 1574–1575 and 1576–1577, several ships were forced to overwinter, with disastrous results for the crews. On the other hand, overwintering could also follow a particularly productive season, when the ship was full of oil and the captain offered a bonus to the men who stayed behind, to free up cargo space. As a general rule, though, ships and crews returned together in late fall to San Sebastián or Bordeaux, where they offloaded their casks of oil and parted ways. The men spent a few months at home with their families before the whole annual cycle recommenced. This was the traditional seasonal pattern in the Basque Country, as in some other pastoral regions in Europe. No atalaya towers have survived in Labrador, but archaeologists have found evidence of a small tile-roofed lookout structure on a high ridge on Saddle Island, at the Red Bay whaling station. Once a whale was spotted, the whalers launched their chalupas and pursued their quarry until a harpooner in one of the boats could strike it. In the traditional Bay of Biscay hunt, the crew then pursued the injured whale. Later whalers attached the harpoon to the boat with a line, so that the whale towed the boat and crew on a “Nantucket sleigh ride”. Champlain’s (1613) account of the Basque hunt mentions this technique, which was also employed at Labrador in the sixteenth century. However, there is no evidence of bollards on the chalupas excavated at Red Bay. Such posts, fixed to the keel, were needed to pay out the line safely as the animal tried to escape. Therefore, in the sixteenth-century Terra Nova hunt, the Basques may have used the older system of attaching a wooden buoy to the harpoon with a short line, so that the injured whale would drag the marker behind it as it fled. No matter what system was used in the sixteenth-century Terra Nova hunt, the harpoon was only the first strike; the crew had to pursue the whale and kill it with lances when it surfaced to breathe. The harpoon was a heavy V-shaped iron point, much like the barbless points still in use in the eighteenth century. Harpoon heads and harpoon shafts, or irons, were procured separately, and a crew might have five heads per shaft. Crews also needed long and short lances, as well as gaffs and lines to manoeuvre the carcass once the whale was dead. This equipment did not evolve significantly for several centuries. Chalupas (shallops, chaloupes) were oar-powered whaling skiffs that carried a lugsail. Each one was manned by a harpooner, a steersman and four to six oarsmen. The Basque chalupa was the prototype for later whaling skiffs, from New England to the Azores, and the well-preserved example excavated at Red Bay suggests that the modern form essentially already existed in the sixteenth century. It is about 8 m long and 2 m wide, which was typical. These skiffs were strongly built, primarily of oak with wrought-iron fastenings. They had a deeply rockered (curved) keel for manoeuvrability, carvel (smooth) construction below the waterline for speed, and lapstrake (overlapping) construction above to maximize flexibility and resist tipping. The Red Bay example is, by far, the best-preserved chalupa used by early modern Europeans in Atlantic Canada. The inshore boats used in the French dry salt-cod fishery were very similar, but their lines might not have been so fine. In the fishery, carrying capacity was more important than speed. The boat crew towed the dead whale back to the shore station for processing, under sail if possible, hence the importance of capturing a whale that floated. Whales may have been flensed afloat or ashore, or perhaps alongside a ship, close to the shore. It would seem most efficient to use the tides and a winch or capstan to bring the whole carcass onto a slipway and flense it there. This was the system used later at Spitzbergen, where the remains of winches have survived. The Grand Bay whalers sometimes flensed whales at sea, but faunal debris recovered just offshore at Red Bay suggests that they often brought the whale inshore for cutting-in, as described by Champlain. A Basque wharf was discovered at Red Bay. Framed with mortised logs, it was used at some stage of the flensing operation, either for landing and stripping the whole carcass or for slicing up large chunks of blubber. One of the main frame timbers has a mortise for a missing vertical timber, which might have been part of a crane. Excavations also uncovered a paved stone walkway connecting the wharf and the tryworks area, where the chunks of blubber were actually rendered into oil. No accurate descriptions of Terra Nova tryworks have survived, but William Burroughs (1576) suggested that four “furnaces” (cauldrons) were needed, “to melt the whale in” for a crew of 55 men with five boats on a 200-ton ship. He added that the men would need “6 ladles of copper”. The trying process consisted of heating minced blubber in open copper cauldrons over a slow fire. The workers used the copper ladles to skim fritters (fenks) from the oil and recycle them as fuel for the tryworks. Each hornos (oven) consisted of roughly rectangular stone walls, about 50 cm thick, surrounding a circular firebox about 1.2 to 1.5 m in diameter. The ovens were often arranged in rows of four or more, like row houses sharing walls between adjacent units. Such ovens have been recorded at several sites, in particular Île aux Basques and the Mingan Islands, Quebec; and Chateau Bay and Cape St. Charles, Labrador. In each oven sat an open copper cauldron. These were likely shallow and not quite hemispheric, also about 1.2 to 1.5 m across with a concave rim. Cauldrons sometimes burst, judging by the remains at Red Bay. Damage to the stone oven walls, from such accidents or from regular use, led to deterioration, and crews often had to rebuild their ovens. A wooden working platform surrounded the stone ovens, and a timber structure roofed with distinctive red clay tiles possibly imported from the Basque Country protected the whole tryworks. After hunting, flensing and trying, the storage and shipment of whale oil was the fourth, and final, step in the sixteenth-century Grand Bay production process. The Basques used a standard shipping container called a barrica, a wooden staved barrel with a capacity of about 200 to 230 litres, about the same as a modern oil drum. The whalers usually shipped barricas to Terra Nova in pieces. Provisioning lists call for about 150 barrels for each boat crew. Since the barrels had to be assembled, and repaired when handled roughly, each shore station needed several coopers. Coopers were recognized as important specialists on whaling voyages and got bonuses for their work. Excavations at Red Bay suggest that these skilled artisans actually lived in the cooperage and enjoyed certain amenities, such as decorated ceramics, not expected by most of the crew. The barrel staves were marked to facilitate reassembly, and the barrels themselves were sometimes identified by the owner’s monogram. The oak used for the staves was imported to the Basque Country from Brittany, which gives an indication of the integration already achieved in the early modern transport zone centred on the Bay of Biscay. Whether or not the sixteenth-century wreck excavated in Red Bay is the San Juan, lost in 1565, or a similar ship lost around the same time under similar circumstances, the find represents an excellent example of a transatlantic workhorse of the period. Ships were not specialized by trade; a ship might be sent to the salt-cod fishery one year and on a whaling expedition the next. So the vessel found at Red Bay tells us about transatlantic technology at the time and not just about the whaling industry. The labels put on the types of ships are notoriously flexible, evolving over time, as did the ships themselves. The San Juan was a nao of 250 tons or so. The Spanish word nao meant ship. The nao evolved from northern European designs, as opposed to the galéon, which was closer to the early-sixteenth-century caravel, a Portuguese design. The sixteenth-century Basque galéon was actually smaller than a nao, which, at 200 or 300 tons, was just the right size to send to the dry salt-cod fishery or for a cargo of whale oil. Ships were built in England, northern France and the Basque Country using somewhat different layout and measurement systems. At the same time, technical and stylistic details evolved. The San Juan is of a transitional design, harking back to earlier traditions (for example, with its complex one-piece keel) and prefiguring later developments (for example, in standardization of design). In the sixteenth century, the nao typically had a beam / keel / overall length ratio of 1:2:3. It was replaced in the seventeenth century by similar ships with sleeker lines, the ratio being more like 2:5:7. Taking a broader view of the early modern period, the three-masted ship, the typical vessel of transatlantic commerce from its inception around 1500, can be considered one of the great technical inventions of European history. As the analysis of the San Juan has shown, the design of three-masted ships evolved from the sixteenth century to the end of the eighteenth century, when this type of ship was replaced by schooners and similar vessels equipped with fore and aft rigging, rather than square sails. A few wrecks of seventeenth- and eighteenth-century three-masted ships have survived in Atlantic Canada and along the shores of the St. Lawrence, but, unlike the San Juan, none has preserved the details of construction and use. The Red Bay wreck is, of course, a ship of its own particular time and place, but it can also help us imagine maritime life in the Atlantic world over the course of several centuries. Basque activity in the Grand Bay raises questions that go beyond the discussion of everyday life. Some observers, including Nicolas Denys, thought the Basques had earned a certain pre-eminence in the maritime world, in part because of their technical expertise. What follows, therefore, is as much a discussion on certain aspects of the daily life of Basque mariners in the Gulf of St. Lawrence as a discussion on Basque whalers. Did the Basques have technical or cultural advantages? courir le marigot is when the fishermen go and hide in some little cove of the shore, or under the lee of rocks, instead of going upon the fishing grounds; something which happens only too often. There they make a fire for roasting Mackerel, and make good cheer. Then they sleep until one or two hours after noon, when they awake and go upon the grounds. There they take what they can, a hundred or a hundred and fifty Cod, and return to the staging like the others, fearful of being scolded. They are the first to grumble, alleging their bad luck … (Denys 1908: 323). It is in this respect the Basques have an advantage. Possessing good garments of skins, they go rarely to the marigot and are little slothful. At evening they come to the stagings and have their boats loaded, while the other fishermen have not half as much. Also the latter call the former all sorcerers, and say that they play the cap [joüer la Barrette]; the latter is a cap which they wear upon the head, and which they turn repeatedly when they are angry. All these reproaches are founded only upon the hate which all the fishermen bear towards them, because they are more skilled at the fishery than all the other nations (Denys 1908: 323–324). One would give little credence to this kind of generalization if it came from someone who looked good in comparison, but Nicolas Denys was not Basque. He was from La Rochelle, so he had no particular reason to flatter the Basques, other than his long experience in the fishery. The idea that the Basques worked within a distinctive economic culture and with some technical advantages is not implausible. They may have deferred to the Bretons in navigational knowledge of Terra Nova in the 1520s and 30s, but by the time Martin Hoyarsabal published the first rutter (handbook of navigational information) for the waters of Atlantic Canada, in 1579, they had clearly developed great expertise. The navigational aids found on the San Juan, including a binnacle, a compass, a sandglass and one of the earliest log lines known (for estimating speed through the water) attest to this sophistication. The Basques had clearly developed a vernacular whaling technology that other ethnic groups could not even imitate in the sixteenth century. When others began to catch up, in the early seventeenth century, they were very much dependent on Basque whaling expertise. The chalupa was not the only element of Basque whaling technology passed on to later whalers. Sixteenth-century Basque Terra Nova whaling technology was, in fact, the direct ancestor of subsequent European whaling technologies. The next major whaling industry developed on the Arctic island of Spitzbergen, in northern Scandinavia. The Basques began to send expeditions to the area in the 1580s, when the Grand Bay whale hunt declined. The English vied with the Dutch in developing shore-based whaling stations there as well, the Dutch prevailing in the 1620s, although the Basques continued to send whaling expeditions to the north until 1688. Both northern nations sought and employed Basque expertise in developing their industry. The Dutch in turn developed whaling technology and passed their knowledge on to American colonists in New Amsterdam and southern New England. The Americans passed their adaptation of the technology on to the Azoreans they employed as crews, and so on. Whaling and sealing techniques used in Canada in the eighteenth and nineteenth centuries may likewise have been learned from Basque mariners. Denis Riverin, seigneur of Matane, actually hired harpooners in Bayonne in 1690 to teach the basics of whaling to Canadian fishermen. Whether or not this effort was successful, it is clear that the contribution of the Basques to the settlement of New France lay in the maritime world. Each Basque whaling crew consisted of oficiales (officers and tradesmen), ordinary seamen, and boys apprenticed either as seamen or oficiales. The captain made verbal agreements with his crew, hiring about 25 men per 100 tons of vessel, so perhaps 60 men for a 250-ton ship. The captain normally invested in the whaling tools himself, but coopers and carpenters had to supply their own tools. Even a small crew included a boatswain, a boatswain’s mate, a steward (purser), a cooper, a caulker, a gunner, harpooners, flensers and boys. Chaplains and pilots might serve several ships on a single expedition. Larger ships might carry their own, as well as a surgeon, and even a diver to make hull repairs. At sea, the division of labour differed slightly from that on land, since coopers and harpooners served only as sailors at sea. Whaling expeditions could produce very large returns; the cost of the ship might be recovered in a single voyage. As a result, arrangements for sharing the profits had to be explicit. On Spanish Basque whaling voyages, one-third of the profits from the cargo usually went to the crew, one-quarter to the ship’s owners and the remainder to the outfitter, with various bonuses paid in oil or baleen to particular oficiales. Individual crewmen’s shares varied widely. Harpooners had very large shares, inferior only to those of the captain or pilot. A chief harpooner or pilot might get four times as much as an experienced ordinary seaman; a gunner, surgeon, cooper or flenser, twice as much; while ship’s boys had to be content with a quarter of a seaman’s share. Crews were paid exclusively on the basis of the success of the voyage, which may be why the issue of courir le marigot was not a problem in the Terra Nova whale hunt. Another factor keeping whalers at work when they needed to be may have been that the pace of the hunt offered more time off than the cod fishery. The object of the hunt was larger, creating a lot of work when a whale was captured, but also implying periods of waiting watchfully. Cod, on the other hand, were normally taken hand-over-fist, and crews were expected to work long days throughout a short season. A well-organized apprenticeship system made inegalitarian share distribution acceptable to ordinary mariners and apprentices, as well as ensuring that the various complex traditional whaling skills were passed on from generation to generation. Apprentices and ship’s boys were often sons or nephews of sailors and tradesmen. They might be as young as eleven or twelve years old. Attrition among boat crews, who took great risks, would have made advancement within this specialty relatively rapid, but all Basque whalers could advance through the ranks, with experience. European crews interacted with Aboriginal peoples from the earliest days of the transatlantic industries in Atlantic Canada. 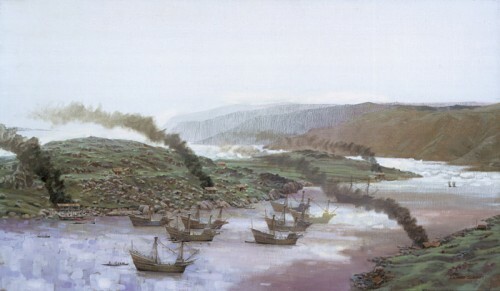 Significant Basque participation in the cod fishery, in the 1540s, followed Breton and Norman commitment to the industry by a decade or two, so it is not surprising that the Normans preceded the Basques in the beginnings of a fur trade with Aboriginal peoples in the Gulf of St. Lawrence. Yet, in the second half of the sixteenth century, the Basques became the pre-eminent European traders in the region. Basque crews are known to have traded with the Beothuk of Newfoundland, the Innu (Montagnais) of Labrador and the St. Lawrence North Shore, and the Mi’kmaq of Gaspé, Chaleur Bay and Cape Breton. Sometimes, they also employed Innu workers at their whaling stations in the Strait of Belle Isle. The Basque fur trade peaked in the late 1580s and culminated in the establishment of a Basque trading post at Tadoussac at the end of the century. Unfortunately for Basque merchants, they were forced out of the Canada trade after 1600. Their exclusion became official in 1645, when migratory fishers lost the right to trade for furs with Aboriginal peoples in New France. Only companies to which the king of France had granted a monopoly could engage in such trade. Between 1560 and 1600, or even a bit later, the Basques dominated trade with the Aboriginal peoples of the Gulf of St. Lawrence. This dominance is reflected in the widespread archaeological survival of distinctive Basque trade goods, including axes and copper kettles, which found their way inland, far into the Iroquoian and Huron territories in what is now Ontario. Another indication of close Basque interaction with Aboriginal peoples was the development, in the sixteenth century, of a pidgin trade language that left traces of Basque in the vocabulary of some Aboriginal languages in the region. Did the Basques have some special interest or ability in dealing with Aboriginal peoples? This is not far-fetched, keeping in mind that they are themselves an ethnic isolate, surrounded by peoples of another language family. The Basques were already used to dealing with people who spoke another tongue, incomprehensible at first, and with the complex arrangements that might permit strangers to engage in mutually profitable trade. This experience cannot have hurt them when they met Canada’s First Nations. Perhaps this cultural skill can be added to the technical and economic skills that so impressed Nicolas Denys. Lord, it is by your grace, more so than because of our skill, that we harpooned the whale and wounded it. Therefore, All-Powerful Lord, help us immobilize the great fish of the sea quickly. Without injuring any of us when it is caught with a rope around its tail or its chest, because it is strong, without the boat keeling over, without it being dragged with the whale to the bottom of the sea. Spare us all these ills, so that we may give you thanks once we are back upon the shore. There is much to be gained, and great peril: watch over us and preserve us from harm … (Etcheberri 1627, translation). There were other risks. One was associated with the trying ovens. The numerous copper cauldron fragments recovered from fireboxes indicate that these vessels sometimes burst, spilling hot fat into an even hotter fire. The flames from such a spill would have been a grave risk to renderers and mincers working nearby. The major disease risk for whalers, as for fishers, was probably scurvy, caused by a deficiency of vitamin C. Later on, mariners began taking scurvy remedies with them on their voyages. By 1600, visitors to the New World had learned, perhaps from Aboriginal peoples, that a decoction of the needles of eastern white cedar or fir had such properties. Another general risk was being stranded in Labrador if ice blocked the coast. In Terra Nova, death was, as the saying goes, part of life. With several hundred men engaged in a dangerous industry, the Basque whalers at each station would expect a few of their companions to die each season. Excavations in the cemetery at Red Bay uncovered roughly 150 skeletons, which suggests a minimum average mortality of three men a year. Those facing death conceptualize it in various ways. The whalers’ prayer noted above was not the only one recited; there were others. The dying could also give legal expression to their wishes. The earliest surviving will written in what is now Canada was penned on Christmas Eve 1584 in Carrolls Cove, Labrador, by the barber-surgeon of a Basque whaling crew. Joanes de Echaniz, who was from the town of Orio, in Guipúzcoa, left small donations to various churches and asked for masses to be said for his soul and for the dead. He left most of his estate to his daughter and asked to be buried in the family’s tomb, as well as for the “offices and obsequies” and “other usual offerings for people of [his] rank”. These rituals, he begged, should be performed even if he died in a place from which his body could not be transported. The men who died in Labrador were usually buried there. Most of the burials at Red Bay are within one contiguous cemetery area. Most people were laid on their backs, in an extended position with their heads to the east, facing Jerusalem, although there were exceptions. Excavators uncovered both single and multiple burials. Some burials were marked with rows of two or three boulders. Since priests accompanied crews to Terra Nova, we can be sure that traditional funeral ceremonies would have been performed. One burial might even be that of a priest; the body bore a large wooden-cross pendant. Priests may have participated in the Labrador voyage not only to guide the souls, and perform last rites and burial ceremonies, but also for the observance of religious rituals considered good luck for a safe and successful hunt. As was the case among early modern fishing crews, deep religious customs permeated both life and death. Bakker, Peter.‘The Language of the Coast Tribes Is Half Basque’: A Basque–American Indian Pidgin in Use between Europeans and Native Americans in North America, ca. 1540 – ca. 1640”. Anthropological Linguistics, vol. 31, nos. 3–4 (1989): 117–147. Barkham, Selma Huxley. “Identification of Labrador Ports in Spanish 16th Century Documents”. Canadian Geographer, vol. 14, no. 1 (1977): 1–9. Barkham, Selma Huxley. “The Documentary Evidence for Basque Whaling Ships in the Strait of Belle Isle”. In Story 1982: 53–96. Barthelmess, Klaus. “Basque Whaling in Pictures, 16th–18th Century”. Itsas Memoria. Revista de Estudios Marítimos del País Vasco, no. 6 (2009): 643–667. Bélanger, René. Les Basques dans l’estuaire du Saint-Laurent, 1535-1635. Montreal: Les Presses de l’Université du Québec. 1971. Burroughs, William. “A Note of Certaine Other Instruments Belonging to the Whalefishing, Received of Master W. Burrough”. In Richard Hakluyt, Principal Navigations of the English Nation, vol. 2: 163. London: Dent,  1907. Denys, Nicolas. The Description and Natural History of the Coasts of North America (Acadia). Translated and edited by William F. Ganong. Toronto: Champlain Society, 1908. Originally published in 1672 as Histoire naturelle des peuples, des animaux, des arbres et plantes de l’Amérique septentrionale, et de ses divers climats. Edge, Thomas. “A Brief Discoverie of the Northern Discoveries of Seas …” In Samuel Purchas, Purchas His Pilgrimes, vol. 13: 5–31. London 1625, rep. Glasgow: University of Glasgow, 1906. Etcheberri, J. de Ciboure. Manual Debotionezcoa…, Bordelen, Gvillen Millanges, Erregueren Imprimat Çaillearencan. Première edition, 1627. Grenier, Robert. “Excavating a 400-Year-Old Basque Galleon”. National Geographic, vol. 168, no. 1 (1985): 58–67. Grenier, Robert, Marc-André Bernier and Willis Stevens, eds. The Underwater Archaeology of Red Bay: Basque Shipbuilding and Whaling in the 16th Century. 5 vols. Ottawa: Parks Canada. 2007. Harris, Ryan and Brad Loewen. “A Basque Whaleboat: Chalupa No. 1”. In Grenier et al. 2007, vol. 4: 309–380. Lien, Jon, Leesa Fawcett and Sue Staniforth. Wet and Fat: Whales and Seals of Newfoundland and Labrador. St. John’s: Breakwater Books. 1985. Loewen, Brad. “Casks from the 24M Wreck”. In Grenier et al. 2007, vol. 2: 5–46. Loewen, Brad and Vincent Delmas. “Les occupations basques dans le golfe du Saint-Laurent, 1530-1760. Périodisation, répartition géographique et culture matérielle”. Archéologiques, no. 24 (2011): 23–55. McGhee, Robert. Canada Rediscovered. Gatineau and Montreal: Canadian Museum of Civilization and Libre Expression. 1991. Mimeault, Mario. Destins des pêcheurs : les Basques en Nouvelle-France. Québec: Septentrion. 2011. Proulx, Jean-Pierre. Whaling in the North Atlantic from Earliest Times to the Mid-19th Century. Studies in Architecture, Archaeology and History. Ottawa: Parks Canada. 1986. Proulx, Jean-Pierre. Basque Whaling in Labrador in the 16th Century. Studies in Archaeology, Architecture and History. Ottawa: Parks Service, Environment Canada. 1993. Proulx, Jean-Pierre. “Basque Whaling Methods, Technology and Organization in the 16th Century”. In Grenier et al. 2007, vol. 1: 42–96. Story, George M., ed. Early European Settlement and Exploitation in Atlantic Canada. St. John’s: Memorial University of Newfoundland.1982. Tuck, James A. “A 16th-Century Whaling Station at Red Bay, Labrador”. In Story 1982: 41–52. Tuck, James A. “Unearthing Red Bay’s Whaling History”. National Geographic, vol. 168, no. 1 (1985): 50–57. Tuck, James. A. and Robert Grenier. “A 16th Century Basque Whaling Station in Southern Labrador”. Scientific American, vol. 245, no. 5 (1981): 180–190. Tuck, James. A. and Robert Grenier. Red Bay, Labrador: World Whaling Capital A.D. 1550–1600. St. John’s: Atlantic Archaeology. 1989. Turgeon, Laurier. “Pêcheurs basques et Indiens des côtes du Saint-Laurent au xvie siècle”. Études canadiennes / Canadian Studies, vol. 8, no. 13 (1982): 9–14. Turgeon, Laurier. “Basque–Amerindian Trade in the Saint Lawrence During the Sixteenth Century: New Documents, New Perspectives”. Man in the Northeast, no. 40 (1990): 81–87. Turgeon, Laurier. “Vers une chronologie des occupations basques du Saint-Laurent du xvie au xviiie siècle : un retour à l’histoire”. Recherches amérindiennes au Québec, vol. 24, no. 3 (1994): 3–15.